Many Of Our Dogs Are Living As Much As Twice Their Normal Lifespans! 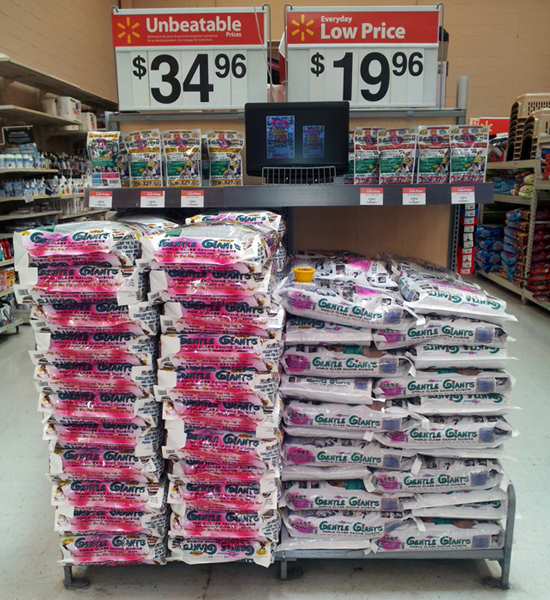 is now available in Walmart! please speak to your local store manager to have it ordered for you! ADDING MANY YEARS TO THE LIFESPAN OF YOUR DOG! We have achieved amazing success in lengthening the lives of our rescued dogs. We have many of our small, medium, large and giant breed dogs living as much as twice their normal lifespans. All dogs can benefit from our feeding and care program! (3) How you care for your dog. Many of our dogs are living far longer than is traditional for their breeds. Our program for increased longevity combines early spay/neuter at 5-6 months of age, our special feeding and care program, and our high nutrition, balanced protein, low fat all natural Gentle Giants dog food. Because our Gentle Giants dog food is so nutritious, your dog can obtain all the nutrition he/she needs by eating less food than with other dog food formulas. This can provide your dog with increased protection against bloat and torsion, a major killer of giant breed dogs, and a killer of other breeds as well. Lard (Saturated Fat) = 0% - to eliminate fat build up on your dog's artieries - other manufacturers of dog food spray Lard (the hardened white fat that you see on a steak the next day that you would never eat) on the outside of their dog food to get dogs to eat their dog food, because dogs don't like the taste of dog food. However, Gentle Giants World Class Canine Cuisine dog food tastes good to dogs because we designed it that way. In three to four weeks after switching your dog to all natural Gentle Giants dog food from any other dog food, your dog can look and act like a new dog! Why? Because with the low fat content inside Gentle Giants dog food, and the dry, non greasy outside of Gentle Giants dog food, the constantly accumulating saturated fat currently surrounding your dog's artieries will flush out and be eliminated from your dog's body, allowing more blood to flow throughout your dog's body, which brings about increased health and nutrition. 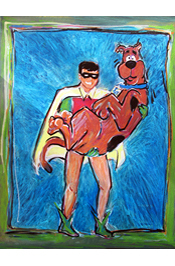 You dog can not only look and feel a lot better. 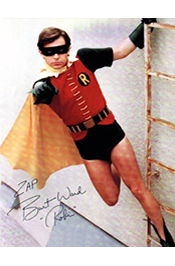 He can feel wonderful and be much more alert and significantly more healthy. Healthier dogs live longer! We recommend Gentle Giants World Class Canine Cuisine dog food to maximize the longevity of all dogs. It is specially formulated with the highest quality ingredients and with the proper balance of protein and fat content to maximize the longevity of all breeds at all ages. In addition to complying with our minimum specifications, all natural Gentle Giants World Class Canine Cuisine contains 3 protein sources, 9 real garden vegetables, 3 natural fruits, and 4 nutritious grains. It also includes enriched levels of antioxidants (Vitamin E, Vitamin C, Beta Carotene) to help support the immune system, sequestered trace minerals (SQM) for improved mineral bioavailability, and numerous important vitamins and nutrients. We elevate all of our food and water bowls at a height so that our dogs don't have to lean down to eat, they just tilt their heads down to eat. We do this to avoid bloat and torsion, the number two killer of giant breed dogs. We do not limit the amount of dog food that we feed at each feeding. If our dogs are hungry, we feed them more. 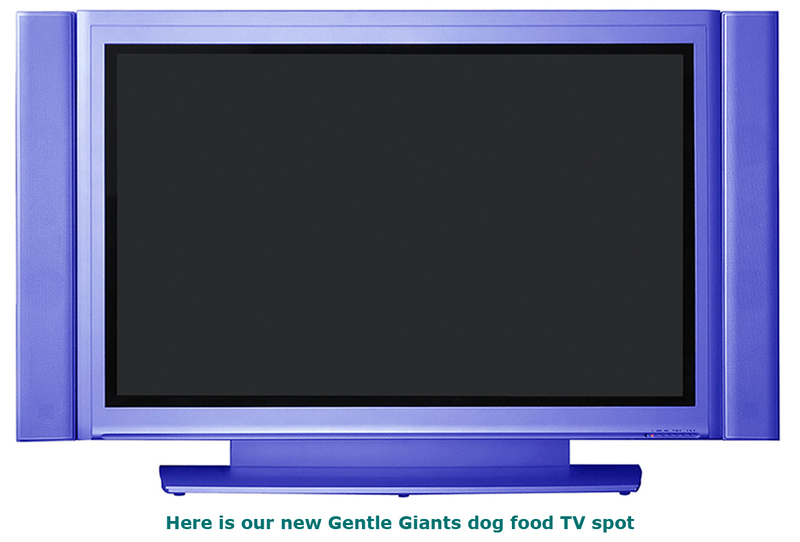 Unlike other dog foods, Gentle Giants is designed for dogs to self-regulate how much they eat. With other dog foods, you need to limit how much your dog eats, so you never know whether or not you are feeding your dog too little or too much. We feed our dry food for 10 to 15 minutes only, and then we remove the food. We never leave the food out (free feed) because if dogs have any stress or exercise with food on their stomach, they can bloat and die. Gentle Giants dog food is designed to reduce the risk of bloat and torsion, a major killer of dogs. Longevity: Our Physical And Emotional Care Has Doubled The Lifespan Of Many Of Our Dogs! We Have Many Of Our Dogs Living 14 To 18 Years, And Some Even Longer! Because we have been enormously successful in prolonging the healthy, happy lives of our Gentle Giants (giant breeds) and our Little Giants (small, medium and large breeds), we have strict care requirements so that our adopters can hopefully enjoy the same amazing success that we have had. Everyone wants their dog to live the longest, healthiest, happiest life, and if you follow our feeding and care techniques and feed all natural Gentle Giants dog food to your dog, you will have the opportunity to love and enjoy your loving canine family member with you as much as twice as long. Many people have traditionally left their dogs outside during the day, and brought their dogs in only at night. Their dogs usually live short lives (in the case of Gentle Giants, usually 7 to 9 years). Some people leave their dogs outside day and night, and their dogs usually live even shorter lives. We cater to the physical and emotional needs of our dogs, and they live a lot longer. When we started rescuing Great Danes 17 years ago (and more than 30 other breeds since then), our dogs were living an average of 7 to 9 years. 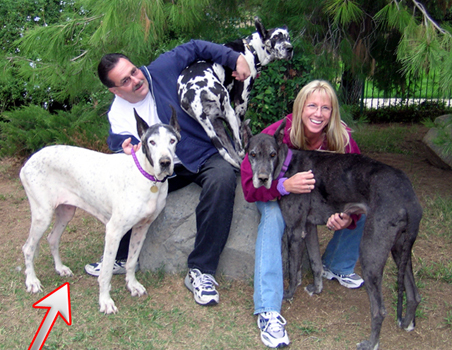 Now, many of our Great Danes and the other 45 breeds that we rescue are living an average of 14 to 18 years, some longer. A significant attribute of our success in doubling the length of their lives is to nurture their needs and instincts, and living inside has shown itself time and again . . . in fact, thousands of times with the small, medium, large and giant breed dogs that we've had living here during the last 17 years, to be a key ingredient in lengthening their lives. All of our Gentle Giants and Little Giants are spayed or neutered at six months of age or as soon as we get them after six months of age. Spaying (females) and neutering (males) does not only prevent excessive breeding, which, if left unspayed and unneutered, results in so many millions of unwanted dogs that end up in animal shelters each year (most of which are put to death), but, spaying and neutering your dog at an early age (the optimum age is five to six months) is critical to extend and prolong your dog's life. Cancer is the #1 killer of dogs, and 85% of all cancers (whether they end up developing in the bones, organs, blood or skin) originate in the reproductive organs. So, by spaying or neutering your dog at an early age, you are giving your dog the gift of a much longer life! This is one of the most important things that you can do for your dog, and it is one of the key things that we do to help our dogs live an average of 14 to 18 years. If you want to adopt a dog from us, you must spay or neuter your own dog prior to be approved for adoption. Also, unspayed and unneutered dogs do not always get along with spayed and neutered dogs, and we have achieved an amazing level of socialization, good behavior and easy handling with our dogs (see Our Gentle Giants Training) by combining spaying/neutering with our immensely successful training techniques. We feel that it is in the best interest and safety for our dogs and for your dog that you spay or neuter your dog before we adopt a dog to you. The sun's rays can be very detrimental to your dog's health. Giant breed dogs and some smaller breeds need to stay out of the sun. Most giant breeds have a single coat of fur, and have no protection against the harmful rays of the sun. They can develop skin cancer very quickly. Once the skin cancer develops, the dogs usually develop internal cancerous tumors as well. This can quickly lead to death. Other breeds of dogs have a short, thick inner coat of fur that protects them from the sun. Because most giant breeds do not have a short, thick inner coat of fur, they should not be allowed to lie out in the sun at all. Our care and feeding program has worked magnificently for the thousands of giant breed dogs and many small breed dogs in the last 16 years here where we could see and experience the results first hand. No one else in the country that we know of who cares for dogs has accomplished this or anywhere near this to our knowledge. That is why we do what we do and why we have (what may seem strict to some people) the requirements that we have. In the end, the dogs we adopt have proven to be living longer, happier lives in their new adopted homes, and that has made their adopters happier because their loving canine companion is with them longer. You can read this first hand in the many emails that we have posted on our website. You can experiece the same or similar results with your dog by following our feeding and care techniques and by feeding all natural Gentle Giants dog food to your dog. ANSWER: Because we are not prematurely killing them by how we care for them, by how we feed them, and by what we feed them. Dogs are physically not designed as sophisticated as humans are. Their bodies wear out easier and much sooner than ours. So, if we want to keep our dogs with us longer, we need to make a special effort to feed and care for them to maximize their life spans. We will tell you how to do that so that you can enjoy the same success that we've had, and so that you can have your dog with you a lot longer! Speaking our our success in helping dogs to live much longer lives, please watch the Fox News video at the top of our home page. Many of the dogs that in that video are 10 to 19 years old, already living twice their normal life span. 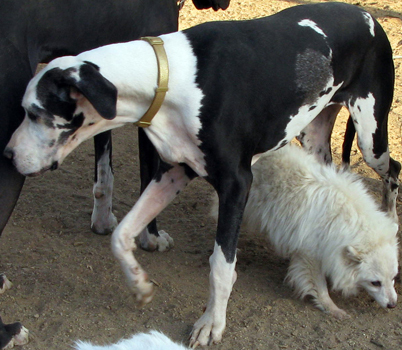 Please check out the harlequin (white with black spots) Great Dane "puppy" climbing up on me as I sit on a bench. Her name is "Galaxy" and she is 17 years old, already twice the normal life span of a Great Dane (Great Danes traditionally live 7-9 years). Also note "Rhino", the Mexican hairless dog in my arms as I stand on our little bridge. "Rhino" is a Xoloitzcuintle who is also 18 years old! ANSWER: We are worlds apart from other dog food manufacturers. Dog food manufacturers are in the business to make money selling you dog food. 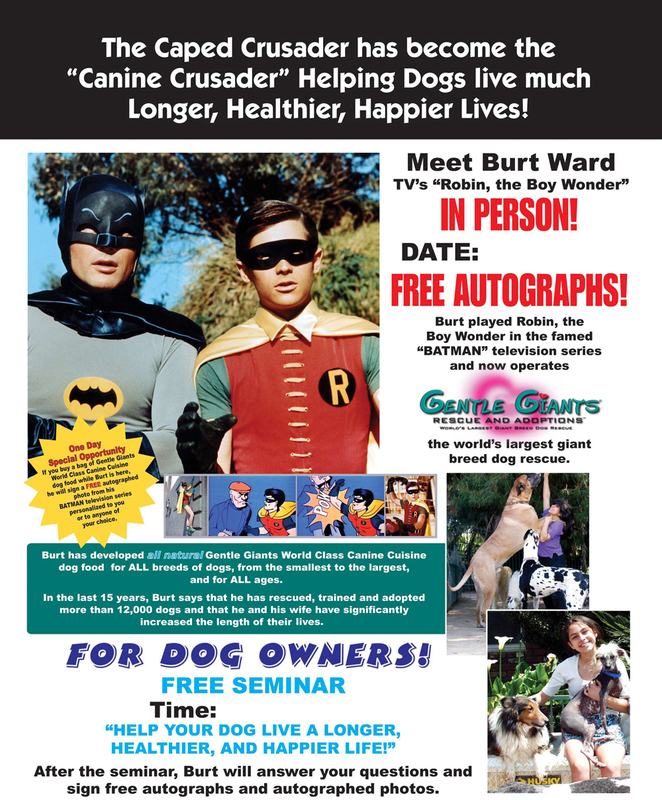 We're in the charitable business of helping dogs live longer! Dog food manufacturers' main focus is on MAKING MONEY WITH DOGS. Here at Gentle Giants, our main focus is on ADDING YEARS TO DOGS LIVES! We measure our success by how long dogs live, not on how much money we make. Dog food manufacturers test their dog food on dogs in cages in laboratories (usually 10-15 dogs during a 1-2 week period). We've tested our dog food on thousands of dogs since 2005, feeding 600 lbs. of our all natural Gentle Giants DAILY! Who do you think has conducted more valuable testing on more dogs in a real life situation rather than testing a few frightened dogs couped up in cages in a testing laboratory? ANSWER: Other dog foods are not designed for your dog to self-regulate how much your dog eats. In fact, they are designed just the opposite way . . . to make you dog eat more of their dog food! Other dog foods contain too much fat, among other things, which makes your dog more hungry! So, when you feed your dog other dog foods, what is actually happening is that the dog food that you are feeding to your dog is making your dog wanting more and more, which may be good for the dog food manufacturer who gets to sell you more of their dog food, but it is really bad for your dog to overeat. So, what do you do to keep your dog from overeating the dog food that you are currently feeding to your dog? You LIMIT how much you feed your dog to keep your dog from overeating. And why is that so bad? Well, first of all, when you LIMIT how much you feed your dog, you don't know if you are feeding your dog too little dog food or too much dog food . . . you're guessing. Much worse for your dog, though, is the fact that what you are feeding to your dog at every meal is making your dog more and more hungry, and then by you denying your dog the additional dog food that he/she thinks that he/she wants/needs, you are causing your dog to always be hungry and to be stressed that he/she can't have all the dog food that he/she wants to eat, leaving your dog ALWAYS HUNGRY. How much shorter do you think that your own life would be if you were always hungry? And if your current dog food contains more than 9% fat content (please see "Guaranteed Nutrient Analysis" as required by law to be printed on every bag of dog food), what you are feeding to your dog is filling your dog's body with excessive fat and nutritionally empty calories. Do you remember the story on TV several years ago called "Super Size Me?" A man went into McDonalds every day eating every meal there for one month. He gained 50 lbs. and became quite ill. He gained the weight because of the fat content in the food that he ate. A recent report currently circulating through veterinarian clinics states that as many as 43% of all the dogs in America today are overweight. Ask your vet if your dog is overweight, and if so, ask your vet if being overweight can and will likely shorten your dog's life? The answer is "Yes." Occasionally, someone says that their dog is not hungry and leaves dog food in their bowl. When we ask them if their dog is overweight, they admit "Yes." 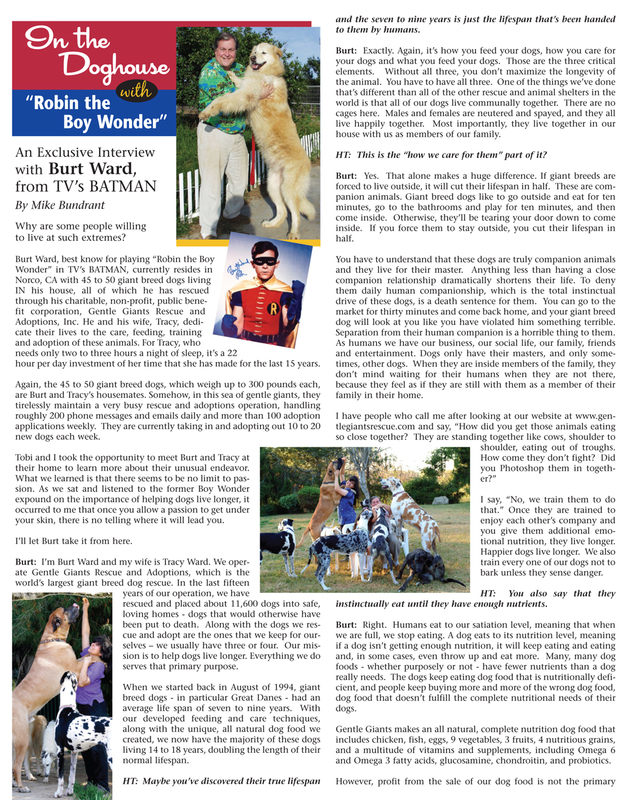 Then, we ask them how energetic their dog is, they answer "Not as much as he used to be." This is an unhealthy situation where their dog is being overfed and is not as fit and healthy as he should be. ANSWER: Assuming that your dog is not being tricked into believing that he/she wants more and more dog food by the excessive fat content in the dog food that you are currently feeding to your dog, when your dog eats all natural Gentle Giants dog food, your dog gets all the nutrition that he/she needs with low fat content, so your dog won't feel hungry, won't feel stress, won't become overweight, but instead will feel better, and can live a much longer, healthier, happier life. Please watch this video (CLICK HERE) of our dogs self-regulating how much of our all natural Gentle Giants dog food that they are eating. You will notice that NONE of our dogs are overweight and ALL of our dogs are HEALTHY and LOOK GREAT! ANSWER: All natural Gentle Giants dog food has maximum nutrition with minimal fat content. ANSWER: You can easily discover that for yourself. Take what we call "The Clogged Arteries Test." Closely examine the dog food that you are currently feeding to your dog and compare it to all natural Gentle Giants dog food. Place a small amount of your current dog food into the palm of your hand. For 5 to 10 seconds, use your fingers to rub over the dog food firmly back and forth in your palm, then open your hand. Do you feel a greasy stickiness? If so, that is SATURATED FAT FROM LARD OR ANIMAL FAT that has been sprayed onto your dog's food to get your dog to eat it. Now, think of that greasy stickiness coating the arteries of your dog. Think about what would happen to you if your own arteries were clogged with saturated fat and cholesterol from eating EVERY MEAL IN YOUR LIFETIME with your food coated with lard or animal fat? Now, isn't it easy to understand why dogs live such short lives? Did you also know that dogs get heart attacks just like humans? Now, test Gentle Giants World Class Canine Cuisine dog food in the same way and you won't feel any stickiness - your hand will feel dry. Which dog food do you think is better for your dog's health? Which dog food do you think can help your dog live a much longer, healthier, happier life? ANSWER: Bloat and torsion is the #2 killer of giant breed dogs and a killer of all dogs, including small, medium and large breed dogs. Bloat is the distension of a dog's stomach and torsion is the turning of a dog's stomach which is what actually kills a dog in one of the most agonizingly painful deaths imaginable. Horses get a similar killer called colic. We like to explain bloat and torsion in a way that everyone can easily understand. Do you remember when you were a child and your mother or father said to you, "Don't go in the swimming pool for at least 30 minutes after you eat!" Do you know why your parent told you that? It's because if you have any stress or exercise when you have food on your stomach, you can get a cramp. The difference between what happens to a human and what happens to a dog is that when a human gets the cramp, the human can get out of the pool or eliminate the stress or exercise, lay down, and the human will feel better and be fine. Unfortunately, when a dog goes into the cramp, THEY CAN'T GET OUT OF IT! If this happens to your dog, you have about one hour to get your dog to an expert surgeon, not your typical veterinarian, who can perform open stomach surgery, untangle your dog's stomach and tack the right side of your dog's stomach to the right side of your dog's body wall (muscle to muscle) at a cost of $3,000 to $10,000. (4) Feed your dog five (5) or more times each day. Smaller more frequent meals are much better for your dog than one or two big meals. Translating that to your own life, we suggest that the next time you visit your doctor for a physical, ask your doctor this question, "Am I better off eating one or two big meals each day or four or five smaller meals each day?" You already know the answer. Your doctor will say, "Four or five smaller meals." ANSWER: Giant breed dogs are more prone to getting bloat and torsion than small and medium breed dogs. Nevertheless, all dogs can get bloat and torsion and all dogs can die from it. Remember the movie "Marley and Me?" That's how the dog died in the end of the movie . . . very upsetting, but unlike a dog being struck with cancer, bloat and torsion is ENTIRELY PREVENTABLE! As the world's largest giant breed dog rescue having rescued, fed, cared for and adopted 14,000+ dogs (primarily giant breed dogs) in the last 17 years, we have had to be especially careful with all the dogs that we rescue (usually under great stress when they first arrive here) to make sure that they don't bloat. Over the 17 years of feeding 600 lbs. of dog food every day, we have become acutely aware of what we need to do to avoid bloat and torsion in our rescued dogs. We are most proud of the fact that NOT ONE of our 14,000+ dogs under our care during the last 17 years has ever bloated! Understanding that the best way to avoid bloat and torsion in dogs is to have a minimal amount of dog food in a dog's stomach at any given time (that's one of the main reasons why we feed our dogs five (5) or more times each day), we've spent six (6) years developing our own dog food that contains the maximum amount of nutrition in the smallest quantity of dog food. 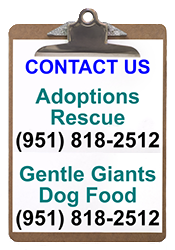 All natural Gentle Giants dog food is the result of our observation and evaluation of feeding 600 lbs. of dog food each day for the last 17 years to our rescued dogs, ranging in size from 2 lbs. to 305 lbs., and ranging in age from 3 1/2 week old infants to 21 year old seniors. QUESTION 9: WHAT IS BETTER FOR MY DOG - EATING INEXPENSIVE GROCERY BRAND DOG FOOD OR EXPENSIVE PET STORE BRAND DOG FOOD? (2) Excessive protein content (more than 22% protein): High end dog food manufacturers want to sell you their dog food. So, how do they market their dog food to you in comparison to the high end dog food of the next manufacturer? They believe that you are more likely to buy their dog food if you see more protein in their dog food. They assume that you will think that getting more protein for your money is better for your wallet/pocketbook and better for your dog. They may be right that you will believe that, BUT NOT AFTER READING THIS! We have found that feeding any of our dogs - small to large and young to old - more than 22% protein can prematurely burn a dog's kidneys out, shortening their life. We have also found that feeding any puppy more than 22% protein in their dog food can cause hypertrophic osteodystrophy (see photo) where their forearms swell up so much that they can't even walk. Further, we have found that feeding any adult or senior dog more than 22% protein in their dog food can cause panosteitis (often mis-diagnosed as arthritis), a lameness that travels from leg to leg in older dogs that cripples them. QUESTION 10: WHERE SHOULD I LOOK TO DETERMINE WHAT THE FAT AND PROTEIN CONTENT IS IN THE DOG FOOD THAT I AM CURRENTLY FEEDING TO MY DOG? ANSWER: Look on the back or sides of the dog food that you are currently feeding. By law, manufacturers must provide a "GUARANTEED NUTRIENT ANALYSIS." The first two items listed are (1) protein content and (2) fat content. The protein content SHOULD NEVER BE MORE THAN 22%! The fat content SHOULD NEVER BE MORE THAN 9%! Even one percent (1%) more protein or fat is way too much for your dog! Most regular dog food has 12% or more fat content. This causes dogs to eat more than they should and more than they need. In the unlikely event that your dog starts gulping down the additional amount, then immediately reduce the amount of dog food to the amount that you were feeding (using the example above, you would return to feeding 1 cup of Gentle Giants per feeding) so your dog doesn't over eat. Again, using the example above, you should then slowly increase (carefully watching that your dog eats normally) the amount that you feed to your dog until you are up the the 1 1/2 cups of Gentle Giants per meal. Over a period of time, usually two to three months after you have switched your dog to Gentle Giants, you will likely notice that your dog actually eat less of Gentle Giants. This is because Gentle Giants is so nutritious and low in fat content that your dog will only eat what he/she needs and leave the rest. Dogs eating Gentle Giants dog food usually eat about 1/3 less than other dog food formulas, which results in 1/3 less stool and your bag of Gentle Giants lasting 1/3 longer than other dog foods. You should also see your dog look and act healthier, feel better, and lose any extra weight if your dog was overweight. We regularly receive emails from people who dogs have displayed amazing results from eating all natural Gentle Giants. We invite you and encourage you to follow our feeding and care techniques and to feed our all natural Gentle Giants dog food to your dog. Please let us know of your results. 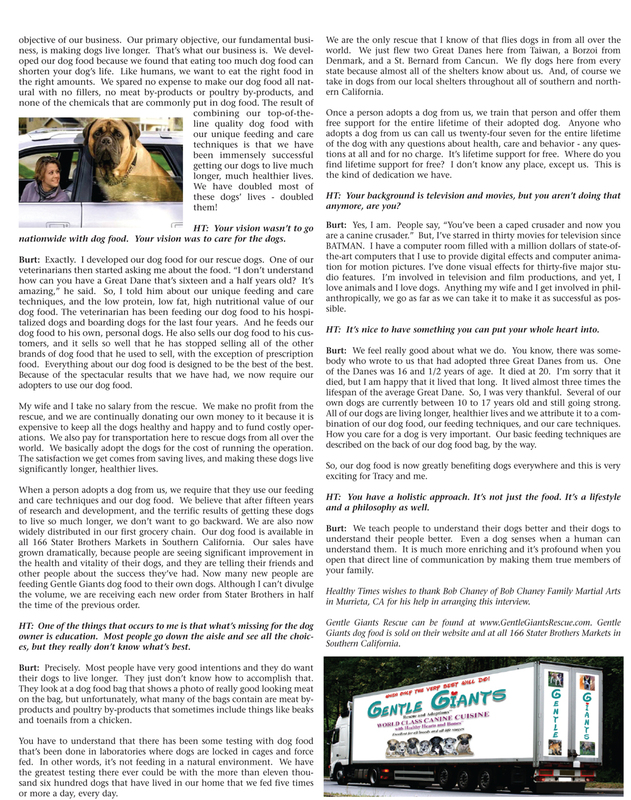 If you have questions, you can send email to us at info@gentlegiantsrescue.com and we will answer every question. We want your dog to live the longest, healthiest, happiest life!